Stou Stratou - A café in Serifos - Why we set up in Chora ? For the many years that we have enjoyed Serifos, we dreamt of opening a café that would also be a meeting place for friends. 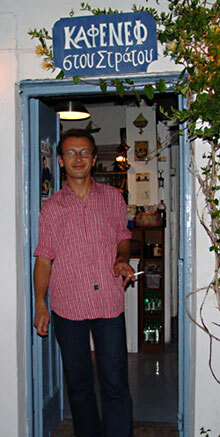 In 2001, Yiorgos, the former owner, proposed that we take the café and it was with pleasure that we accepted. Prior to Yiorgos, Theodore and Maria had the café, which they opened in 1990 after it had been closed for 27 years. In 1963, the closing of the island's mines greatly impacted the life of the square (or "platia") of the café. At the height of mining activity, the square was the center of island life and the most important shopping and social center of the island. There were at least five cafes, two grocers, a butcher, a hair salon, and a bank. Religious and national festivals were celebrated in the square to the sound of traditional songs. The local wine, known well beyond the Cyclades, ran like a flood…. By taking the café, we hoped to inspire again the atmosphere of this time. We could not have done this without the support of Theodore, Maria and Yiorgos, the island officials and the administrative services. We also thank all the merchants for their understanding; Mrs. Sassa and her son Vassilis (who have the grocery opposite the café) for their warmth; the Jiacovos priest for the strength he gives us; Josette and Francoise for their daily company; our neighbor Irini for her motherly touch; and of course Galatia, the café mascot. Last but not least, all the friends who visit us throughout the season.